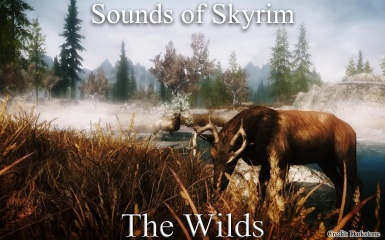 Adds around 115 sound effects that are played in Skyrim\'s wilderness. Distant animals, rain impact on structures and more. Addition: Added 7 new easter egg sounds related to goats that can be heard in the Reach and in Tundra regions. Addition: Added more locations where you can hear ice sheets crackling. Addition: Added an in-game config menu to replace the volume sliders which, unfortunately, didn’t work as intended. Addition: All animals become silent if you are in combat. Addition: Added one new sound category: Horkers on the northern coast. Addition: Added three new bat sound effects. Addition: Added four new deer sound effects. Addition: Added three cuckoo sound effects, birds taking off and two wood pigeons sound effects in the forest birds playlist. Changes: All sounds’ default output volume has been raised for better customization with the new volume sliders. Changes: Added compatibility with Arthmoor’s Open Cities Skyrim. Changes: Reduced the frequency at which most sounds play. Changes: Adjusted the volume of several sound effects. Fix: Cleaned the ESP to prevent crashes or save game corruption. Bug Fix: Fixed the bug where sounds would play in interiors. 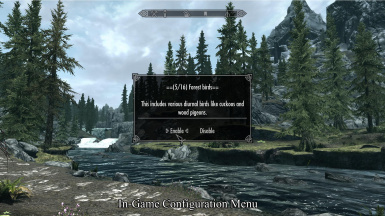 Some mods require a compatibility patch to work with Sounds of Skyrim – The Wilds. You can find the patches on the mod’s download page. If you encounter a mod conflict that is not listed here, please let me know in the Forums tab.